Since we know you and understand what you need and are interested in, Trois G Tea sets up some groups of selected tea samplers by offering you with introductory discounts for your tasting and evaluation. It is not only an affordable way to dabble in the world of tea and also a round-way trip to let you try our tea for the first time. 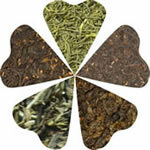 This tea is characterized as fully hand-crafted and truly a sensational work of art. It is grown with only natural organic fertilizers and no agricultural chemicals. 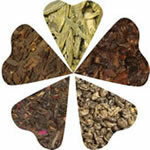 The tea has being widely chosen for blending into some flavored teas. Premium Black Tea is scent with exotic Lychee peels, which is served in Congou Style. Originated from Wuyi Mountain, this Oolong tea is a semi oxidized tea. Dragonwell tea is the most well know and one of China's top three green teas. The tea is tightly rolled into a tiny pellet resembling gunshot with a rich dark luster. It is scented with fresh rose fragance and produces a light, genteel cup with a pleasant aroma. 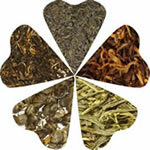 With a medicinal flavor and smoky aftertaste, it improves with age unlike other teas. It is popularly served in many Chinese restaurants all over the world. 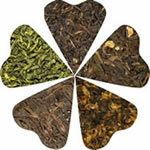 This tea is characterized as weightless bold size leaves of mottled green. 'Yun' in Chinese means 'Cloud' and 'Jian' refers to 'tip' and it is a pure healthful tea. This grade is an exceptionally high quality with rich tasting, earthy and warm. 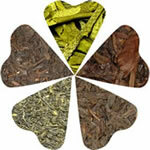 A layer of osmanthus blooms are placed between the black tea leaves during processing. 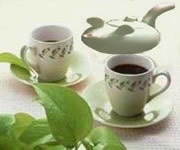 Their large leaves and full flavored tea remain greenish brown with an amber color. It is the rare Keemun hair point and is handmade by a special processing technique. As a pair to Be Lo Chun, the leaves are carefully rolled into the shape of spiral. The leaf is almost coral black, large, loose, slightly curled and smoky. It is named after an emperor's from Qing Dynasty in ancient China. This tea yields a delicate cup with heady bouquet of night-blooming Jasmine. The leaf is in unique appearance, which looks like monkey claws, as legend indicated. It yields strong thick liquor and an abundance of rich, spicy and sappy taste. This tea gets its name from the visual characteristics, referring bushes 'climbing' like a Dragon. The shape of the processed leaves likes 'Eyebrow', which is called Chun Mee. The resulting infusion is relatively a pale, Jade greenish yellow with Vitamins.